As you probably know from reading the ‘Our Story’ page, PhotosinMotion.net was created by me, Joseph Garnett, Jr. Naturally, there is more to the story. Ultimately, I must say PhotosinMotion.net started with a phone call. You see, the reason for that phone call had nothing to do with taking pictures of any kind. Yet, afterwards, many people grew to love the photographs produced over the years. In 2002, I was 10 years into my career as a professional sports photographer and journalist at the St. Petersburg Times. Stationed in our Pasco County office, I was a picture editor managing six other professional editorial photographers. Alongside this role, I was on the football coverage team. I had all the dream assignments of photographing professional and college sports, like Florida State football, Florida Gators, Tampa Bay Buccaneers and even some University of Miami football. It was setting up to be an incredibly fun season, with a few major bowl games mixed in. 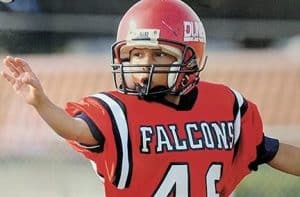 My Son Devon, who was in the third grade decided he wanted to play football. At first, I resisted. I didn’t want him getting hurt. Neither did my wife Sue. I thought this idea of his would subside after a while, but it only got stronger. He soon won over my wife. He still needed me to say yes. After another week of badgering and calling me at work after school, I gave in. I Made The Phone Call. Yes. I called The Dunedin Jr Falcons’ then president Lenny Anderson from my desk at work, asking how to get my son enrolled. He had finally won. That night, I took him out and signed him up for what would be years of fun. Well, my wife and I didn’t realize the hours of weekend commitment involved for a child to do youth football. It’s like almost six hours out of the day. Of course, we couldn’t ask our friends to take him. They probably wouldn’t be our friends anymore. My wife’s busiest day at work was Saturdays. So, she was out. I had this great football photo schedule at work. I didn’t want to give it up. Yes. I did take him and yes, I signed him up. So, two weeks in, I walked into my photo editor’s office and withdrew from all the fun games that were on my schedule. No FSU, No Bucs, No Gators. Hello, DJF and all the other youth teams. WOW! At first, I thought I would still have fun photographing youth football. So, I took my big Canon 400mm f2.8 lens and sat in the stands making photos of my son whenever he got on the field. However, taking photos from the stands just didn’t seem right. Yet, other parents kept asking me to do photos of their children. Then, I thought this could create a business photographing youth sports. I needed a name for the company, access to the fields and a way to sell the photos. So, Sue and I created the name PhotosinMotion.net while brainstorming in bed. I built a website and then began asking permission from the leagues to be on the field. First, it was met with a little push back. So, I would continue to do photographs from the stands. Then, when DJF played at the Tarpon Jr Spongers, PhotosinMotion.net was debuted to all the youth players and fans on the sidelines, thanks to president Robin Wikle. In the coming years, photographing youth sports won its place in my heart. I must admit that I have seen more competitive games there than at some of the higher levels. I also felt that through PhotosinMotion.net, I was helping families preserve memories with photographs they wouldn’t have. This feeling would come especially when my role for the Times would overlap and I would see a photograph in someone’s home or office that I made as PhotosinMotion.net. 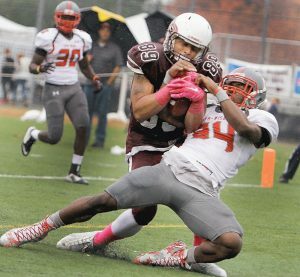 We made many friends along the way as I followed my son’s football career from youth football with the Junior Falcons to high school and on to two colleges, ending with the Fairmont State University Falcons. Looking back, it’s hard to believe that it just started with a phone call. We discovered a whole new lifestyle in those years watching our son and other children grow into young adults. At each stage, PhotosinMotion.net became a part of the expected scenery. Through the years, PhotosinMotion.net has photograph other sports, like baseball, soccer, volleyball, community events, professional and corporate functions and weddings. We have also been there to see some of those same young kids get married. We still get that same level of enjoyment today that we got in 2002 when it first started with a phone call. If you want your league or player photographed, contact us today. PhotosinMotion.net loves to keep the tradition going.